A prepratory year is essentially intended for learning German. Ethics, mathematics, English and sports are also part of this educational stage. During the second semester, the first subject-related courses are held in Chinese. Following further instruction in the German language, CDTF students take the TestDaF exam at the end of their German course at e.g. the TestDaF Center in Quindao during their second year of studying. During the second and third academic year, the subject-related focus of the basic studies is intensified. Students enroll in courses held in Chinese and German. The basic studies at the CDTF in Qingdao are followed by the advanced study program. Provided a sufficient language qualification of proven 16 TestDaF points and upon meeting all the requirements of the basic study program, this can be done in Paderborn. 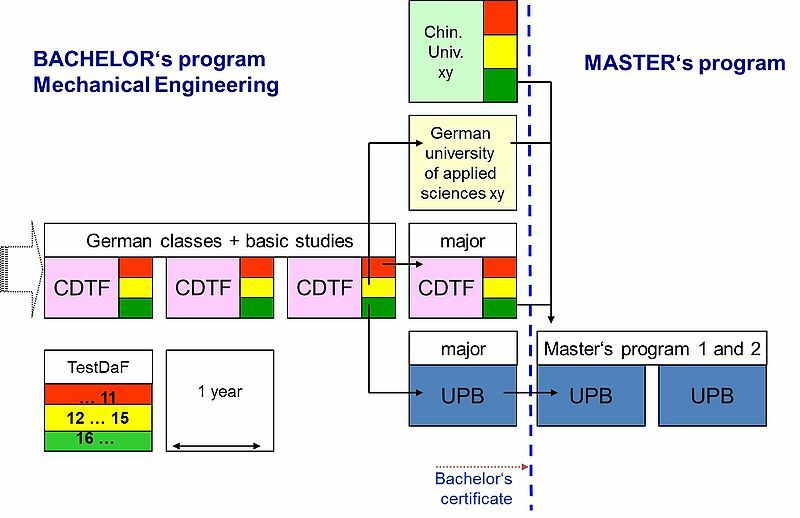 CDTF students not meeting these requirements can transfer to a University of Applied Sciences in Germany or complete their Bachelor’s program at the CDTF in Qingdao. Successful graduates of the Bachelor’s program Mechanical Engineering (from Qingdao as well) will be admitted to the Master’s study program Mechanical Engineering in Paderborn. High-performance graduates of the Master’s program Mechanical Engineering transfer to doctoral study programs at German or Austrian universities. The majority of the graduates of the Master’s program pursue an initial employment at a company in Germany to later on work for this company in China. The following diagram summarizes the setup of the study program Mechanical Engineering at both universities, in Qingdao and Paderborn.